A weekend trip to Newcastle in North East England will be one of the most memorable you will have. Closer to the Scottish capital than England’s, it’s not just the similarity in dialects that we share. The city is proud to be the largest and most diverse in the North of England. We are sure your Newcastle weekend trip will be one you remember for a long time. Where to start, with so many options of what to do from outdoor pursuits, quality food/drinks and a range of it in accommodation to suit any budget. Here’s our outline of a classic Newcastle weekend for a stag, hen, birthday or group catch up. Arrive Friday by one of the many good transport links. Newcastle is easily reached by train from London and Edinburgh with regular services. Likewise air flights from Dublin and Amsterdam are regular and well timed for a weekend away. Once your checked in, head straight to one of the many venues with an outside terrace. A few drinks while everyone arrives is the ideal way to pass the time. Not far from Euro hostel is Alvinos on Pilgrim street, it serves a huge range of beers, wines and cocktails and has a cracking outdoor area. Retire before 2am ready for your activities on Saturday. 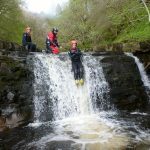 With free transport to and from Newcastle Endless Adventure North East will pick you up and whisk you to the Pennines for a day of adventure activities, providing all the training in outdoor activities you will need.